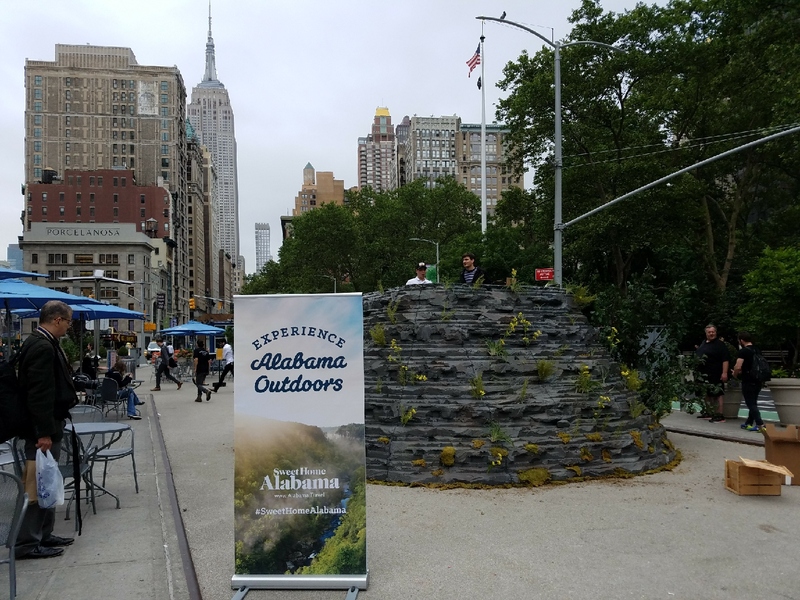 The Alabama Tourism Department brought a little bit of Sweet Home Alabama to the streets of New York City with a promotion that kicked off on June 14, 2017 with celebrations and pop-up events throughout the city for the next three days showing New York locals and visitors why Alabama is a fantastic vacation destination. Festivities began with a launch party at Three’s Brewing in Brooklyn. 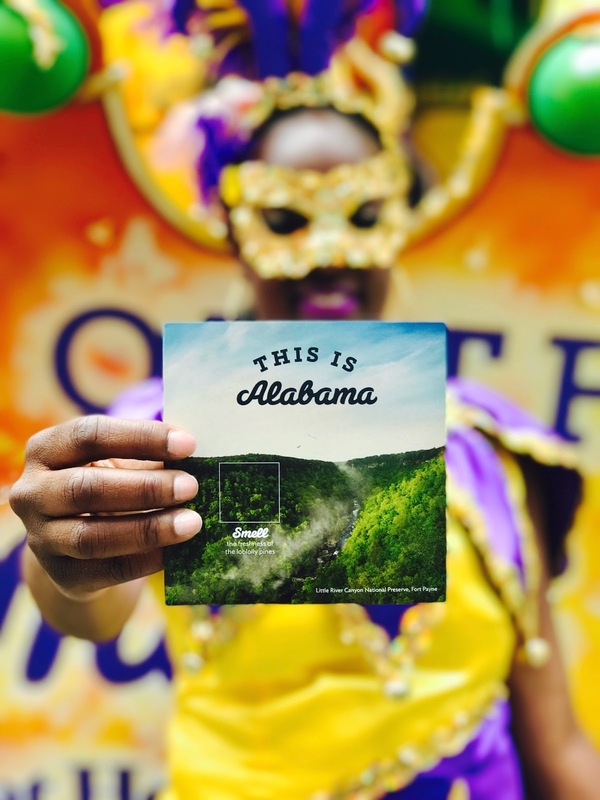 Guests were able to sample Alabama craft beers and food and view a 360-photo booth with locations from around the state. The following day, those in the middle of Times Square witnessed a Mardi Gras pop-up parade with an actual Mardi Gras parade float followed by costumed revelers throwing beads, MoonPies & a Jambalaya Brass Band playing music. The promotion’s final day enticed visitors to take a “hike” up the 20-foot tall and 20-foot wide mountain exhibit in the middle of Flatiron Pedestrian Plaza and view the famous Little River Canyon with a virtual reality headset. Those who climbed the mountain experienced the canyon in a unique way. It was as if they were floating above the canyon and were able to see in all directions. They could see the lush green forests below, the river running beneath it and the magnificent views from above. They were also able to have a digital souvenir photo of their experience to take and share. 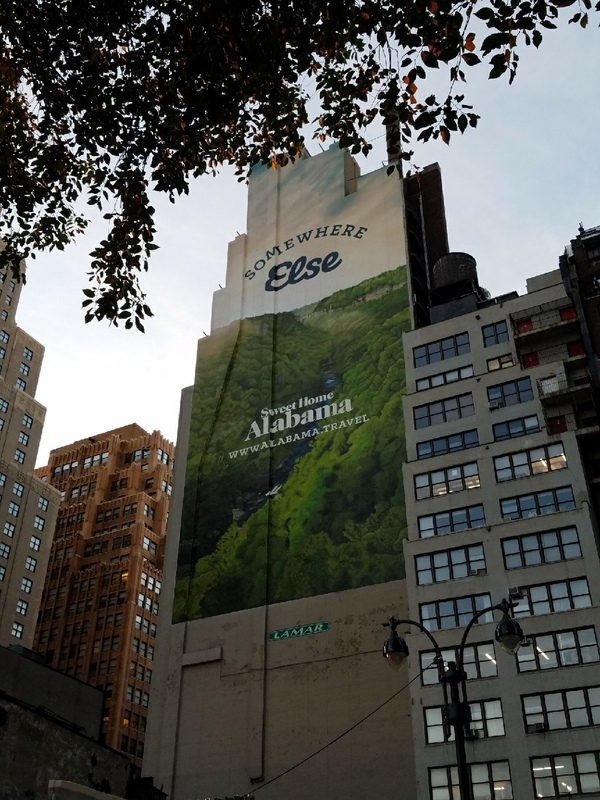 Meanwhile, in the Madison Square Garden area, passersby were able to envision “somewhere else” with a hand-painted wallscape over 20 stories high of the Little River Canyon. The wallscape was up for 30 days for all to enjoy and hopefully begin preparations for a vacation “somewhere else”. Last year, the Alabama Tourism Department set up a beach display of Alabama’s Gulf Coast and visitors were able to take a rest and dig their toes into the authentic snow-white beach sand with a coastline backdrop. Many didn’t even know that Alabama had a beach, just as they were surprised to find that we also had a mountains and a canyon.